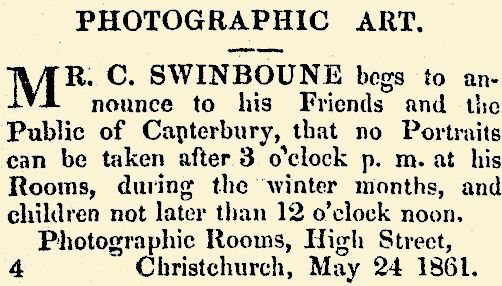 Mr C. Swinbourne, begs is announce that he is now prepared to take correct likenesses, coloured or otherwise, by the collodion process, daily, between the hours of 9 a.m. and 3 (5?) p.m.
Children's likenesses taken daily from 10 a.m. to 3 p.m.
High street, Christchurch, Feb. 16. 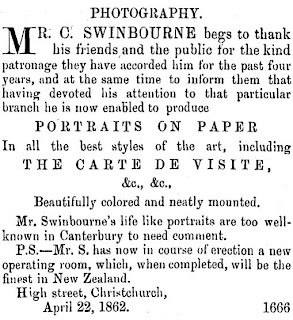 We have always had a strong objection to praise or seen to puff the excellencies of anything that is a native product, simply as such; but we cannot refrain, for once, from commending the successful efforts at photographic portraiture exhibited by Mr. C. Swinbourne since his arrival in this town. We believe that Mr. Swinbourne received his early instruction, in the art from Mr. Elsbee, whose skill as a photographer is so highly, appreciated in this province; and we must say that the success of the disciple reflects credit upon the training he has received as well as upon his own artistic skill. We have seen specimens of Mr. Swinbourne's manipulation which speak for themselves of the progress he has made in a very short time, and which really stand well among the ordinary specimens of the art which are current in the colonies. We wish this painstaking gentleman every success. 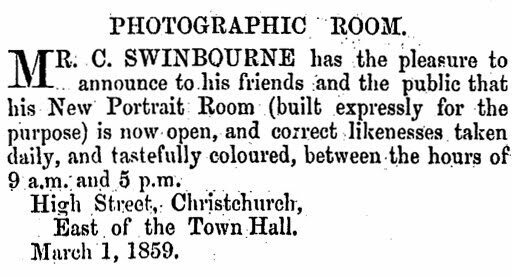 Mr C. Swinbourne begs to intimate to the inhabitants of Timaru, and the surrounding stations, that the above rooms will be opened on the 1st January next, and will close on the 15th. 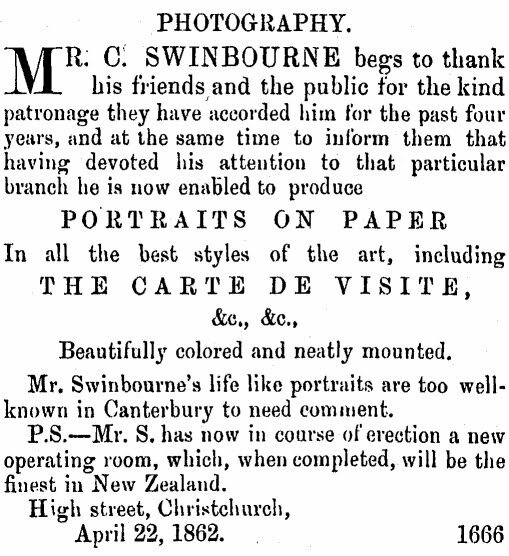 all persons who intend having portraits of themselves, families, or friends, are particularly requested to make an early call, as Mr. Swinbourne's visit will be very short. Likenesses taken by him are well known all over Canterbury, and he will therefore leave them to speak for themselves. The Lyttelton Times, 14 January 1863. Hi I am a descendent of Christpher Swinbourne and am Trying to find a phtograph of him. I have copies of his brother John Foster and most of his nieces and nephews. Which were possibly taken by him. Lovely to read info about him. 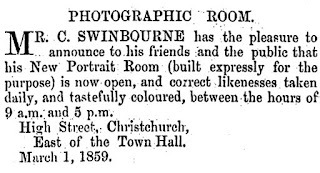 Hello Angela, I am very interested that you are a descendant of Christopher Swinbourne and would be very grateful if you could add any further biographical information to what little is known about this pioneer of photography in Christchurch. 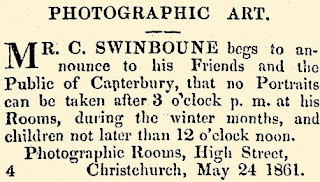 Sadly I do not know of any photograph of Christopher Swinbourne himself, but hope to find one someday. Perhaps someone else will find this site that has a photograph of him. I would be very interested to see any photographs taken by him and would be very pleased to post them on this site. RICHARD SWINBOURNE, born 1789, joined the Louth Regiment of Militia at Collon on 18 November 1806 aged 17, he held the rank of Corporal in the Louth Militia for 18 years and was discharged 24 May 1829 aged 39, he died 3 May 1866 Peterborough (Christchurch), New Zealanad, his occupation at his death was given as 'shoemaker', buried 5 May 1866 Plot 69 Barbadoes Street Cemetery, Christchurch, married c.1810-20 (probably 26 July 1811) Collon Church, Co. Louth, Ireland ANN McGRATH, they followed their son John in emigrating to New Zealand in 1851 aboard the Duke of Portsmouth (account of voyage), departing from Gravesend with their children Christopher and Elizabeth on 20 June 1852 and arriving at Port Lyttleton on 21 October. (Richard was said to have been given a prize by the New Zealand government for the family of six promising sons he brought out with him from Ireland, one source said that they were all over 6 ft 6in tall. CHRISTOPHER CHARLES SWINBOURNE, born 1870, died 1948, (*many letters addresses to him from relatives between 1901-1910 have been published), married c.1901/2 Australia EDEN MAY BOULTON, they lived at South Grafton, Clarence River, New South Wales, Australia, (issue - 2 daughters and 1 son). William and Gleeson had a child Roy Swinbourne, born in 1898. I am a descendent of Christpher Swinbourne and would also like to see imformation and pictures. I do not have original photos and am not sure if they are taken by C. Swinbourne but I have found pictures of his brothers family but only through the internet which I copied for personal use. If I do come across any more info I will share it. Hi Michelle I'm a descendant of John Foster Swinbourne and was wondering if you had any information about his family if you could email me I could fill you in thank you.